Room 14: Earthship and Bees. As you can see the Earth ship is getting closer to being finished. All we need to do is to make another layer of tyres and then hammer the wood boards above them. Our friend Conrad, from Habitat from Humanity, will be helping us to get the wood we need. Terry our bee keeper bought in eight frames of big plastic bees to show us what they are gonna look like. This one shows a plastic queen bee and some workers bees. They feed her so she has the energy to lay 2,000, 000 a year. Two of them have real honey combs and they smell really nice. He bought in frames that show what the bees do inside the hive. 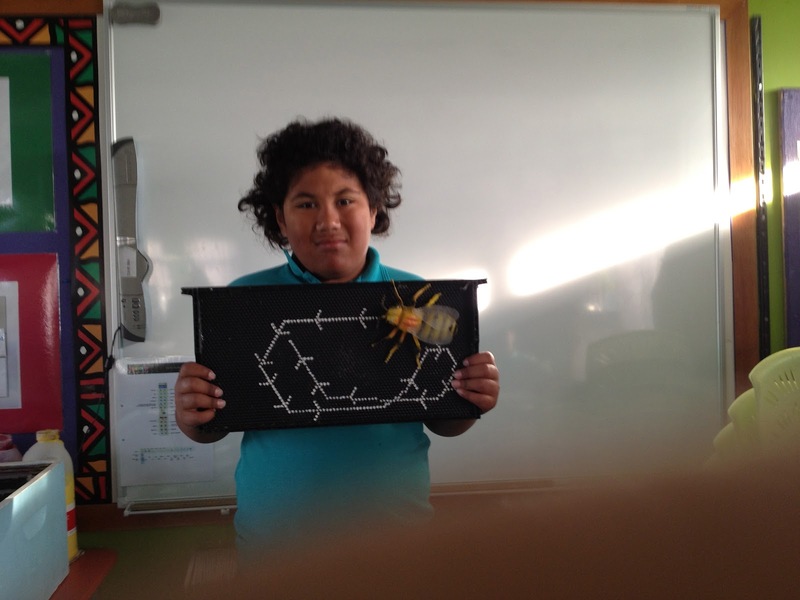 This frame that Payton is holding shows the path a worker bees takes to do a dance. Bees cannot speak so they communicate by dancing. We haven't learned what this dance means, but when we do we'll let you know! We think you are doing a good job making your Earthship. In Room 1 we are writing about how bees get nectar from the flowers and fly back to their hives. Do you know how bees make honey Room 14? Monaro wants to know if you can make us some honey? Leasu wants to know if the bees will sting? Johnnivy asks why are you learning about bees? They also wanted to know how you are going to make the hive?